VISALIA - Each year the Visalia Chamber of Commerce honors those businesses and individuals who consistently go above and beyond to support the community. This year is no exception as dozens of nominations have been submitted for the 2014 Man and Woman of the Year as well as Small, Medium, Large, Non-profit and Agri-Business of the Year. This year the Chamber will introduce the Emerging Leaders Award. The Emerging Leaders Award will recognize multiple young professionals for their contribution to the local community through volunteerism and community activities, strides they are making to better themselves via professional development activities and their professional accomplishments. 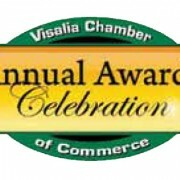 Winners will be announced at the 61st Annual Awards Celebration presented by the Visalia Chamber of Commerce on Thursday, June 19, 2014 at the Visalia Convention Center. Hors d’oeuvres and cocktails begin at 6:00 p.m. followed by a formal dinner at 7 p.m. and the program at 8 p.m.
Tickets for the Annual Awards Celebration are $70 or a table of 8 for $520. They can be purchased at the Visalia Chamber of Commerce located at 220 N. Santa Fe Street. Limited sponsorships are available; call the Chamber office for more information at (559)734-5876.